I’m going on a short business trip at the end of this month. I’m tempted to give myself a mini-challenge, and pack and wear for the trip only clothing I’ve made, myself. A sort of test, if you will, to see how well I’m laying down the groundwork for the larger project: can I, by the end of January, get by for just a few days with nothing store-bought? It’d be easy if I stick to shift dresses, I have enough of those by now! But I’m not sure how many days in a row I want to wear just a shift dress. Harder, if I try to do separates. Harder still when limited to things that coordinate with my most comfortable walking shoes! I have some good work-ready hand-knits from years past, but what this idea reveals, even in its conceptual phase, is a lack of handmade tops: while I have some knitted overlayers, I still rely on basic shells and tanks and shirts along with my handmade skirts. And there’s the shoe thing. I foresee a lot of forced pairings with black. Still, I’m tempted to try it. I like the idea of living out of suitcase filled with items that are unique to me. I’m planning on making a number of short (2-4 day) trips this year, and if I do it consistently, each trip, it may be a good measure of progress along the way. 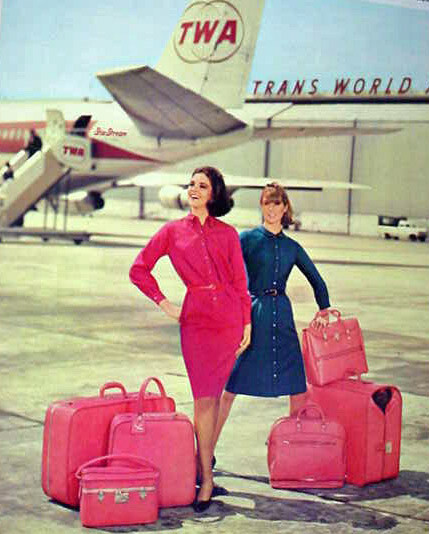 In the fantastical world of my imagination, this all looks glamorously like an old airline ad. A carefree, jet-setting lifestyle of freedom brought about by modern technology and fashion. Reality, of course, has a way of turning out somewhat different.